Defrost timer for with adjustment with 15 minute increments. Defrost Timer 24-7 for slush machines. Over rides the freeze switch when timer is activated. 120V. Used in Bunn CDS and ULTRA , Cab Faby, SPM, Elmeco Mach, Ugolini models HT, NHT, MT, Giant. 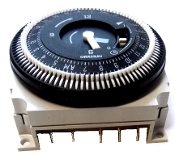 Each pin pulled outwards around the dial is a 15-minutes defrostnincrement setting. Start the setting by moving the hour and minte arms to the time when the settings are being programmed. The three settings of Defrost timer with extended function control switch: 1- Buttons pushed up to the top = Extended Defrost setting. 2- Button in Middle position = Defrost time bypassed. Allows controls from switch box. 3- Switch button in lower position = 24 hour freeze mode. The freeze timing settings must be programmed carefully to avoid expensive damage to auger and gear motor.